WABC TV came to Hudson and got more reactions to Kirsten Gillibrand being appointed Senator. Columbia County Democratic Committee members, Supervisor Doug McGivney (D-Kinderhook), Cyndy Hall Columbia County Democratic Committee 1st Vice-Chair, Rose Aulino NYS Democratic Delegate and Andrew DeGiacomo (Stuyvesant) all set the record straight about Senator Gillibrand for WABC TV. "On Tuesday, we saw the power of our democracy at work. We witnessed yet again the peaceful and Constitutional hand off of power from one President to the next. "Today, we must follow the laws of New York State. Our laws empower the Governor to appoint a new Senator if a seat should come open. It is my privilege and my responsibility to make this choice on behalf of the people of New York. "That is why I am proud to announce my appointment of Congresswoman Kirsten Gillibrand to represent New York in the United States Senate. I am appointing Kirsten Gillibrand because she is the right leader for this decisive moment in our history. "Over the last two months, I have had the honor of interviewing a wide range of New Yorkers for this position. And I come away from this process deeply impressed with the number and caliber of people who could fill this seat. "The next junior Senator from New York will have big shoes to fill. This seat has been held by icons of New York State: Robert Francis Kennedy, Daniel Patrick Moynihan, Hillary Rodham Clinton. "I did not ask for this privilege. But I understand that this decision is one of the most important I will make as Governor. And from the beginning of this process, I have approached this choice with the utmost gravity. "Throughout this process I have had an open mind. My administration first compiled a list of New Yorkers interested in serving. I then conducted individual interviews with potential candidates and spoke with other elected officials, advisors, and citizens from across the State to get a wide range of opinions about whom I should appoint. I asked each candidate to fill out a detailed, confidential background questionnaire, which was carefully reviewed by my Counsel's Office. Finally, after thinking long and hard about it, I made my decision based upon who would best serve the needs of our citizens. "I knew that we needed someone who will fight for working families. I knew we needed someone who could improve our State's health care and education systems; someone who could help develop our State's economy and help rebuild and restore the integrity of our financial services industry. I knew that we needed a leader for our times who can help us overcome the grave economic crisis we face. Finally, I knew that we needed someone who was committed to the next generation. "I did not seek out a candidate because of their gender, race, religion, sexual orientation, or regional base. I looked for the best candidate this State could offer. "Hillary Clinton's confirmation as Secretary of State was a bittersweet moment for all New Yorkers. On one hand, we were thrilled that someone of her caliber would be representing America to the world. But on the other hand, at a time of grave economic and fiscal challenges, we were losing one of our strongest voices and most powerful advocates. "I am proud to say that we have found an extraordinary New Yorker to follow in the mold of Hillary Clinton. "Kirsten Gillibrand is not only a rising star; she also possesses a deep understanding and a strong record of accomplishment on the issues that matter most today. "In a time of economic and fiscal crisis, she has fought for responsible policies every step of the way—middle class tax cuts, quality and affordable health care, economic security for families, and assistance for family farms. She has worked on these issues since the administration of President Clinton, when she served as Special Counsel to the U.S. Secretary of Housing and Urban Development, Andrew Cuomo. "At a time when we are at war, Congresswoman Gillibrand has a deep and thorough understanding of foreign policy. In fact, she was the lead sponsor of legislation that would implement the recommendations of the bipartisan 9/11 commission. "At a moment when New Yorkers and Americans are demanding reform, Kirsten Gillibrand is a leader on integrity and a champion of transparency—in fact, she was the first member of Congress in American history to post her public schedule and earmark requests online each day. "And at a time when our nation is ready to put aside partisan divides, Congresswoman Gillibrand has a strong record of working across the aisle. In 2008, she received more votes than any other person running for Congress in New York State. Her immense popularity in her home district, which stretches across ten Upstate counties, is a testament to her ability to bring people together and to her tireless work as an advocate for the people of New York. "Kirsten has something fundamental in common with our new President-elect. As a young girl, growing up in an Upstate town, she was deeply inspired by her grandmother, Dorothea Noonan. Dorothea, known as Polly, was a founder of her hometown's first Women's Democratic Club and a fighter for women's rights in her region. "During her career in law, and during her tenure in Congress, Kirsten Gillibrand has lived by those lessons her grandmother taught her every day. I am deeply privileged and extremely proud to appoint her to represent the people of New York in the United States Senate." 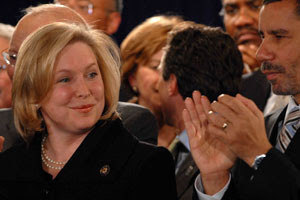 Congresswoman Kirsten Gillibrand was first sworn into office on January 4, 2007, and is serving her second term as U.S. Representative to New York's 20th Congressional District, which stretches across the Upstate counties of Saratoga, Dutchess, Columbia, Rensselaer, Washington, Warren, Delaware, Greene, Essex and Otsego. In her first term in office, Congresswoman Gillibrand established herself as an independent leader in Congress. She was the lead sponsor of legislation that would implement the bipartisan 9/11 Commission Recommendations, which will help protect our borders and keep America safe. She has been an advocate for decreased federal spending, and introduced legislation that would require the federal government – just as all New York families do - to balance their budget every year. Finally, she has made tax cuts for Upstate and North Country families, one of her highest priorities. She has authored legislation that would double the tax credit for child care expenses and make up to $10,000 in college tuition tax deductible. Congresswoman Gillibrand has taken unprecedented steps to make her office accountable and transparent to her constituents. She was the first Member of Congress to publish their public schedule online at the end of each day, and as a strong proponent of earmark reform, she voluntarily released every earmark that she requested that would invest in Upstate and North Country priorities. 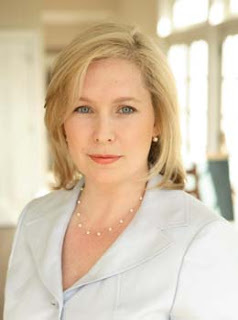 Congresswoman Gillibrand serves on the House Armed Services Committee and the Agriculture Committee. On the Armed Services Committee, Congresswoman Gillibrand serves on the Terrorism, Unconventional Threats and Capabilities subcommittee and the Seapower subcommittee. On the Agriculture Committee, Congresswoman Gillibrand serves on the Livestock, Dairy and Poultry subcommittee, Conservation Credit Energy and Research subcommittee and the Horticulture and Organic Agriculture subcommittee. In addition to her committee assignments, Congresswoman Gillibrand founded the Congressional High Tech Caucus with Representative Michael McCaul with the goal of ensuring that the United States remains at the forefront of emerging technologies and high tech industries. 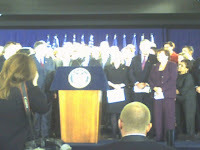 During the administration of President Clinton, Congresswoman Gillibrand served as Special Counsel to the U.S. Secretary of Housing and Urban Development, Andrew Cuomo. At HUD, she played a key role in furthering HUD's Labor Initiative and New Markets initiative, working to strengthen enforcement of the Davis-Bacon Act and drafting new markets legislation for public and private investment in building infrastructure to revitalize lower income areas across the nation. Following federal service, Congresswoman Gillibrand entered the private sector, joining one of the Country's premier law firms. As a partner in the firm, she worked on a wide range of legal and policy related issues, requiring the knowledge and ability to negotiate on the highest levels, skills which serve her constituents well as a Member of Congress. Congresswoman Gillibrand is a firm believer that those in a position to do so have an obligation to "give back" by serving their community. In addition to her responsibilities at the law firm, she maintained an extensive pro-bono practice for clients whose voices are seldom heard and needs seldom addressed. Her service on behalf of abused women and their children, and tenants seeking safe affordable housing without lead paint hazards has been tireless. At the heart of Congresswoman Gillibrand's core values is the inspiration of her grandmother, Dorothea (Polly) Noonan, who was a founder of the area's first Women's Democratic Club and was a pioneer for women's rights in the region. Congresswoman Gillibrand has hit the ground running in her new position as the Representative for New York's 20th Congressional District, she commits herself to deliver her best efforts to serve the people of the entire district regardless of political affiliations. She embraces her responsibilities with gratitude to the many thousands of voters who put their faith in her, and promises to never forget where she came from or whose interests she seeks to serve – the people. Raised in the Capital Region, Congresswoman Gillibrand attended the Academy of the Holy Names and Emma Willard High School. She received a Bachelors Degree in Asian Studies from Dartmouth and a Juris Doctorate from UCLA. 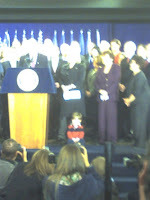 The Congresswoman is married to Jonathan Gillibrand and they have two children, four-year-old Theo and infant Henry. The family resides in Hudson, New York. Governor David Patterson has appointed Kirsten Gillibrand to the Senate seat previously held by Secretary of State Hillary Clinton. 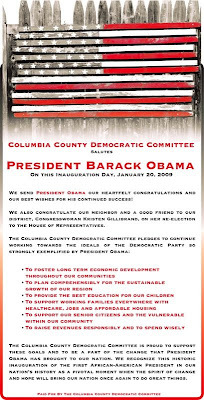 The Columbia County Democratic Committee extends our thanks to Governor Patterson and our congratulations to Senator Gillibrand. Attending the ceremony on behalf of the Columbia County Democratic Committee, Chair Chris Nolan snapped the following pics. from 5 pm - 8 pm. Obama's Inauguration Speech will shown on video and there will be live TV coverage of the events in Washington. 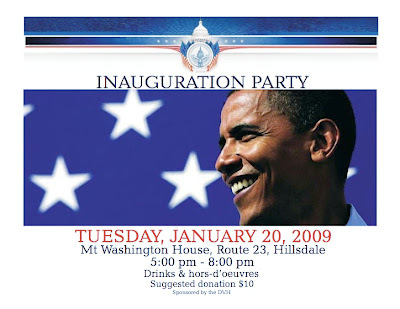 The suggested donation is $10 and there are a limited amount of VIP packages ($25), which will include inaugural souvenirs and a photo with Obama. There will be hors d’ouvres from 5 -8 and domestic wine and beer from 5 - 7 pm. Cash bar for everything else will be available throughout. It will be great fun and a great way to celebrate this joyous and historic event. If you have any questions or would like to RSVP please call 325 7849 ask for Kelly or email DVH@fairpoint.net.